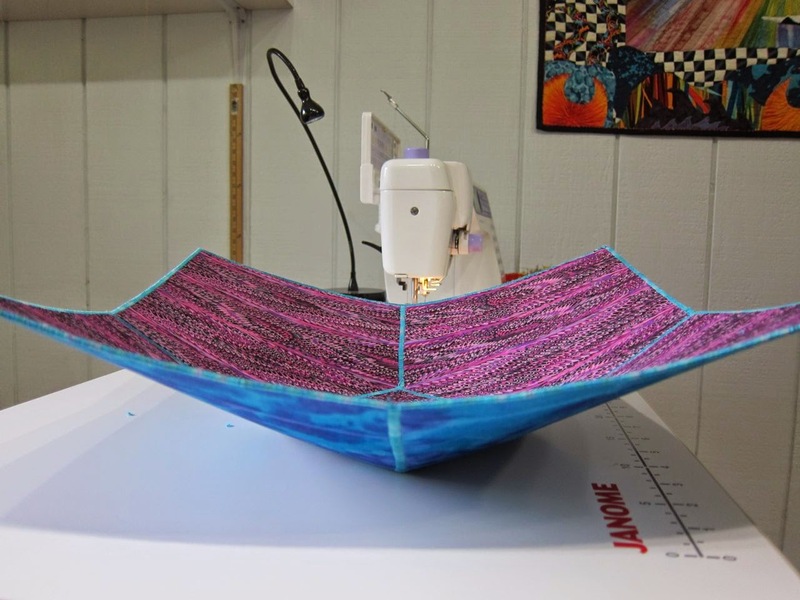 Fun, Fast and Easy Fabric Bowls...and you don't need a pattern! When working on a large quilt or art project I find I need a diversion if I am feeling "stuck". Working on a quick easy project is a good way of get those creative juices flowing again they make me feel like I accomplished something. These fabric bowls fit the bill perfectly, they are easy to make, don't require a pattern, and are very forgiving of mistakes. Try out these instructions. If you have any questions, or better yet, suggestions, please let me know. Here is a list of the items you will need to complete this project. 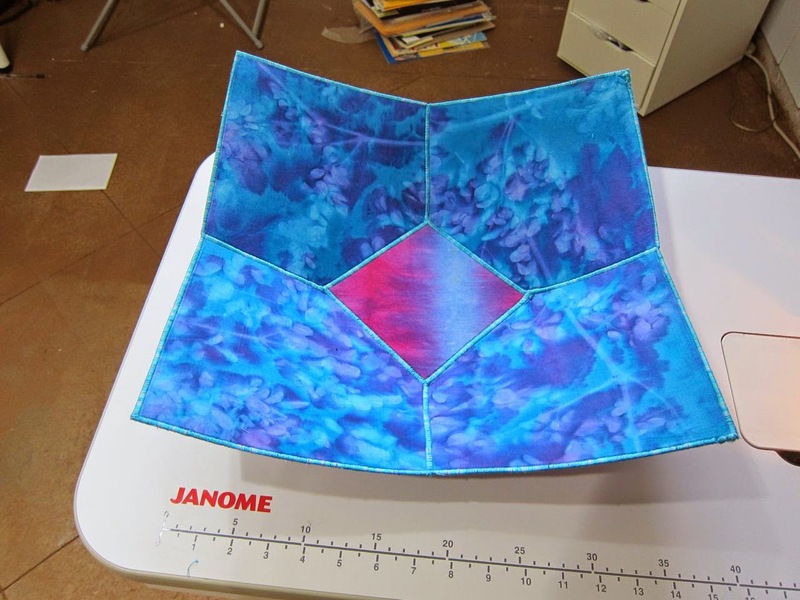 One 16 inch square of double-sided, fusible stabilizer. I use Pellon Peltex 72F Ultra-firm. 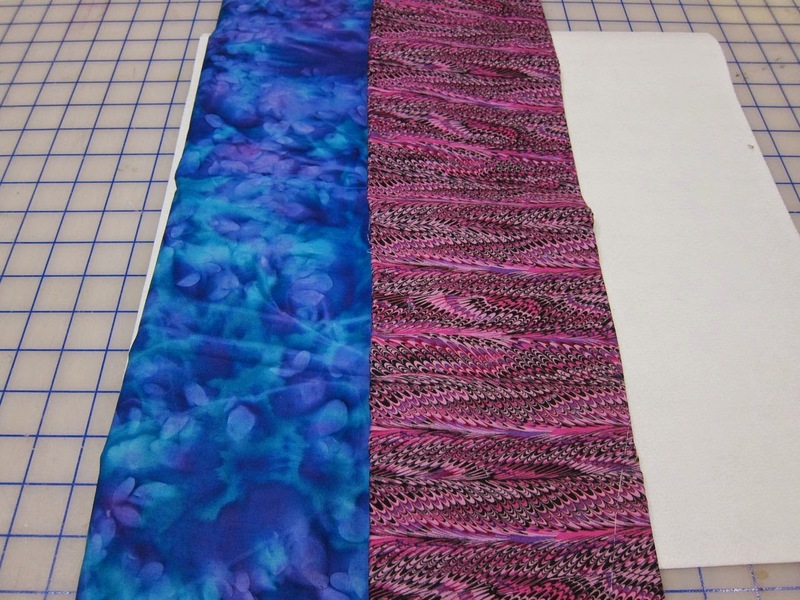 Two 18 inch squares of two fabrics that you really like. I like to fabrics that have some contrast. 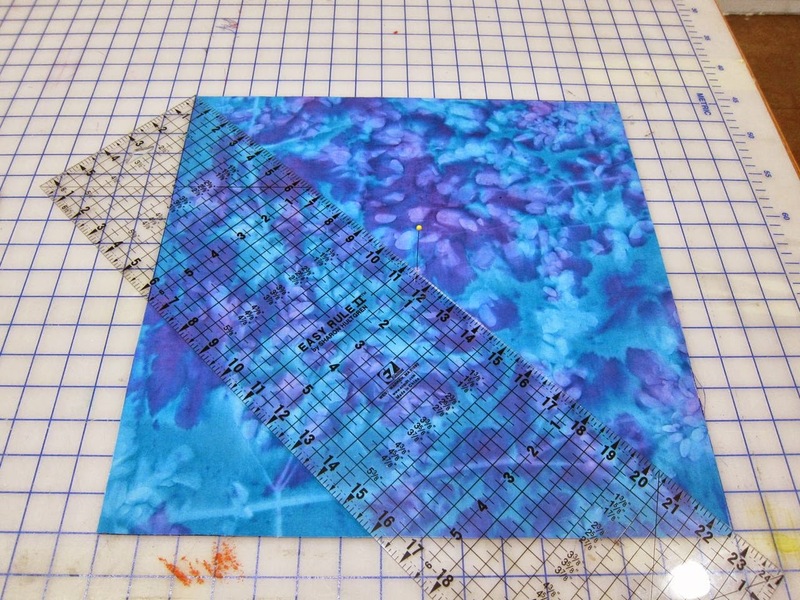 A 6 inch square of Wonder-Under fusible interfacing. 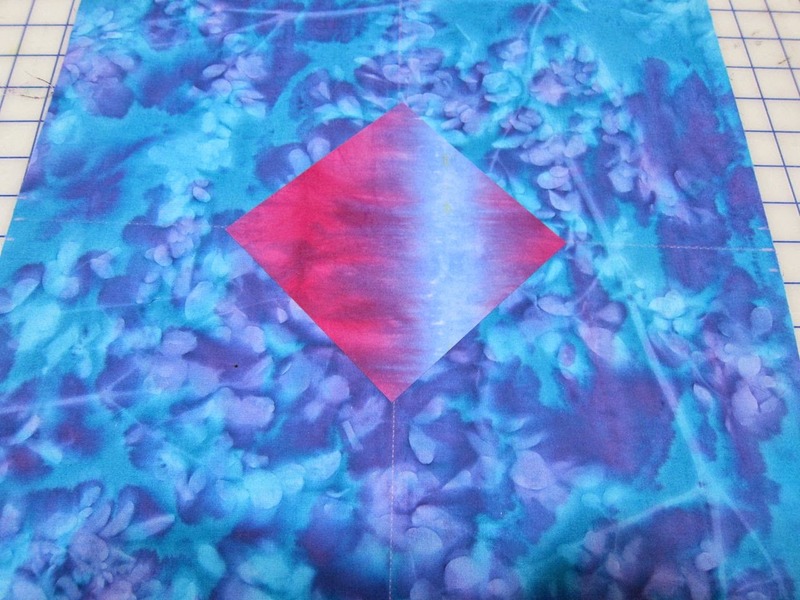 A 6 inch square of another contrasting fabric. (You can use a matching fabric but I always like to a fabric that makes one of my other main fabrics pop. Any thread color you feel goes well with your fabrics. I chose a blue, variegated thread. Misc sewing items: rotary cutter (or scissors), a ruler at least 16 inches long, an iron, a marking pencil and a sewing machine. For this project I chose a blue fabric and pink fabric. I wanted to make sure that everyone could see the contrast. 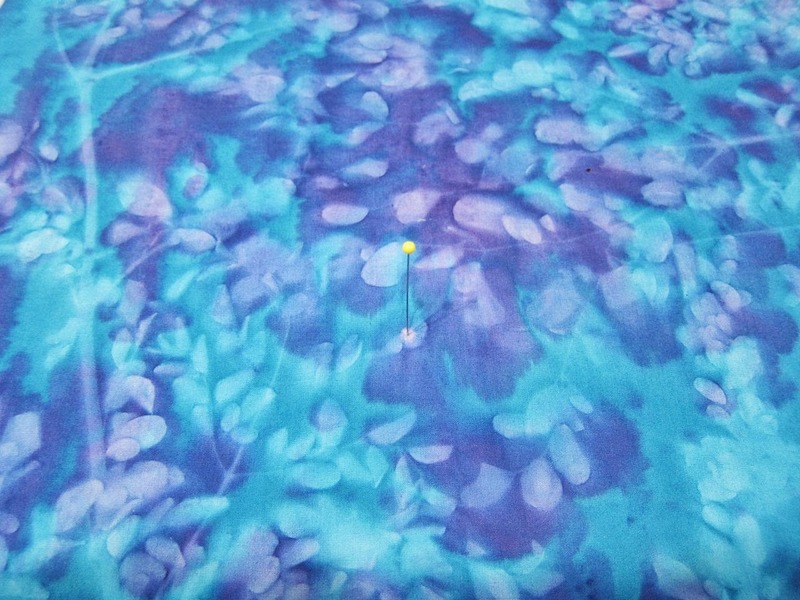 I chose a hand dye for my center square. Measure and cut your firm stabilizer to a perfect 16 inch square. If this works best with a rotary cutter but you can use scissors if you need to. Iron your fabric and make sure that it is wrinkle free. 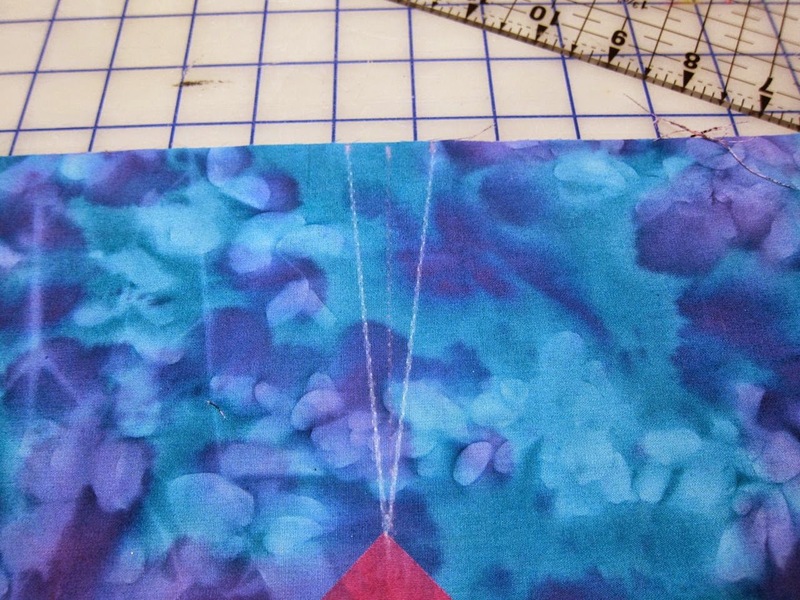 Iron on your first fabric on to your stabilizer. Iron from the center out. 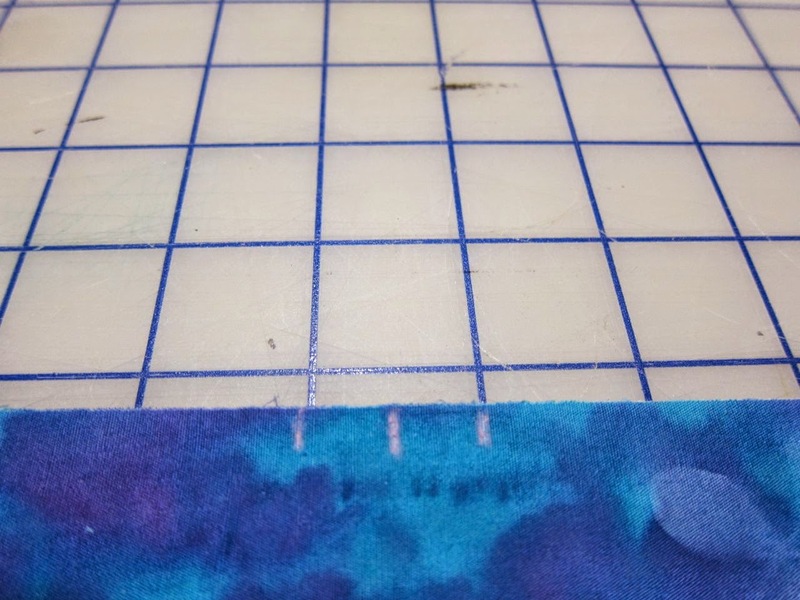 I use a high cotton setting on my iron for this project because I want to make sure my stabilizer adheres well to the fabric. 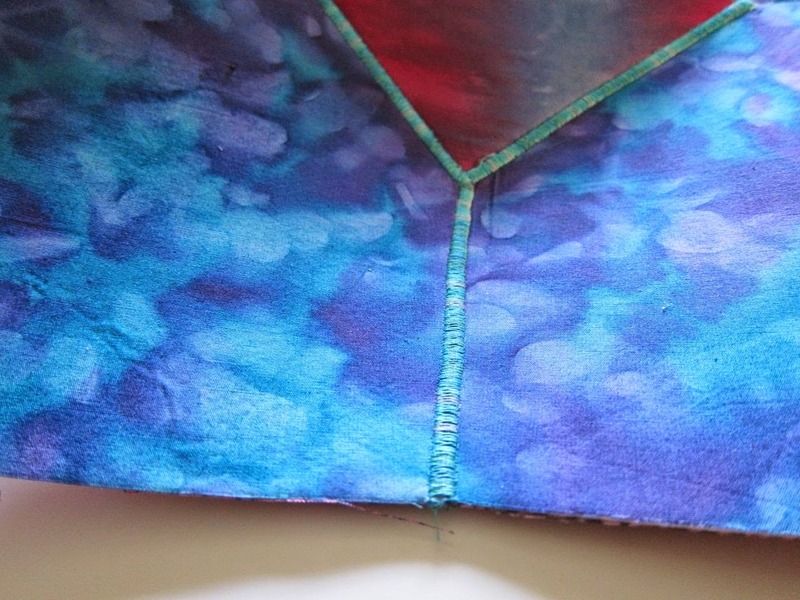 Turn the stabilizer over and iron your next piece of fabric to the other side of the stabilizer. Take special care with the edges and corners. One you are done, let the fabric cool (usually takes just a few minutes.) Look for any areas that did not adhere properly. Re-iron if necessary. 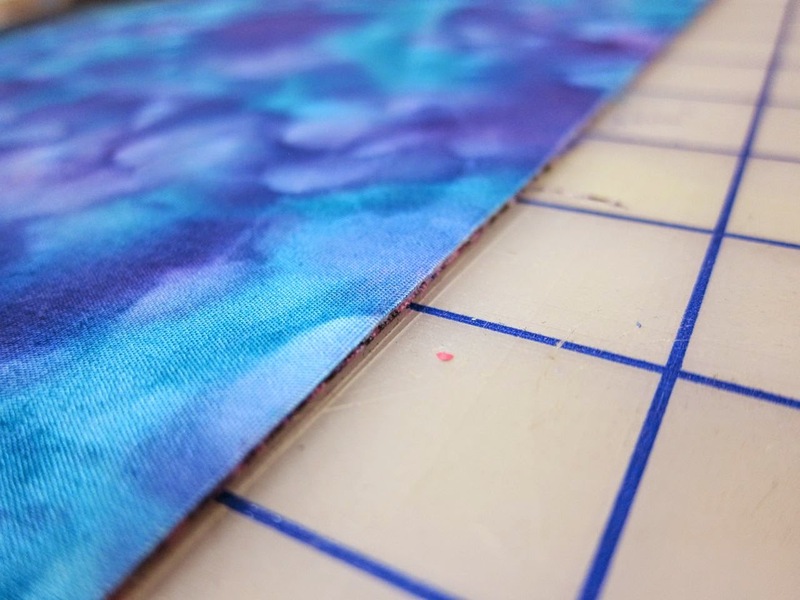 Trim away the excess fabric from the stabilizer. Be careful not to trim the stabilizer. If you do, your bowl will no longer be square. (In the event of an unintended trimming, just resize the square to make sure all sides are equal. As I said, it is a "forgiving" project". Take your small contrasting fabric square (I used a 5x5 piece of fabric for this bowl) and back the fabric with Wonder-Under. 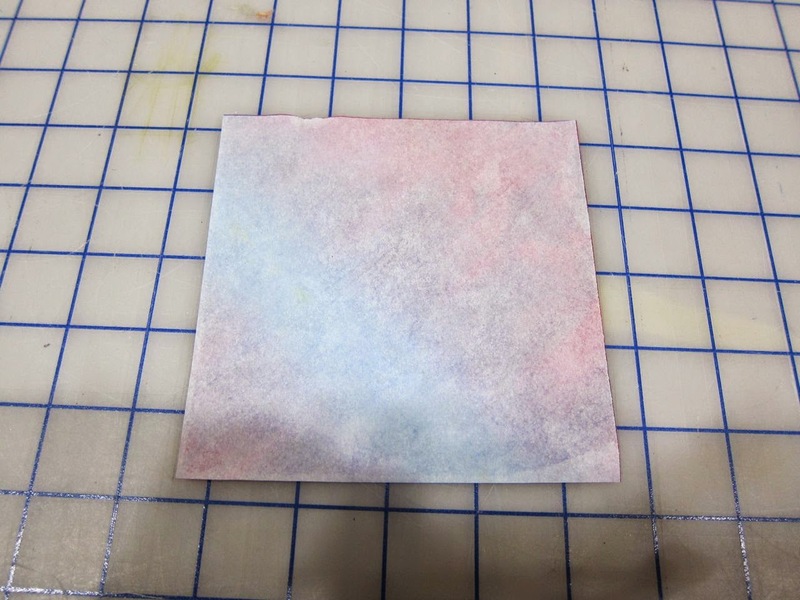 Peel off the fabric backing. (Note, the size does not have to be exact, it just has to be square). Just be aware the size of this small square will affect the the shape of your bowl. 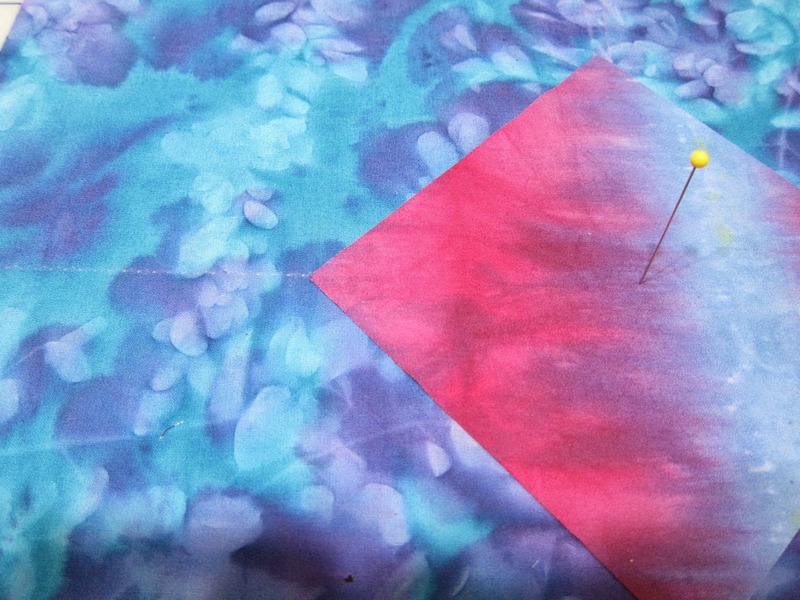 Turn the fabric over and find the center of this piece of fabric and mark with a straight pin. 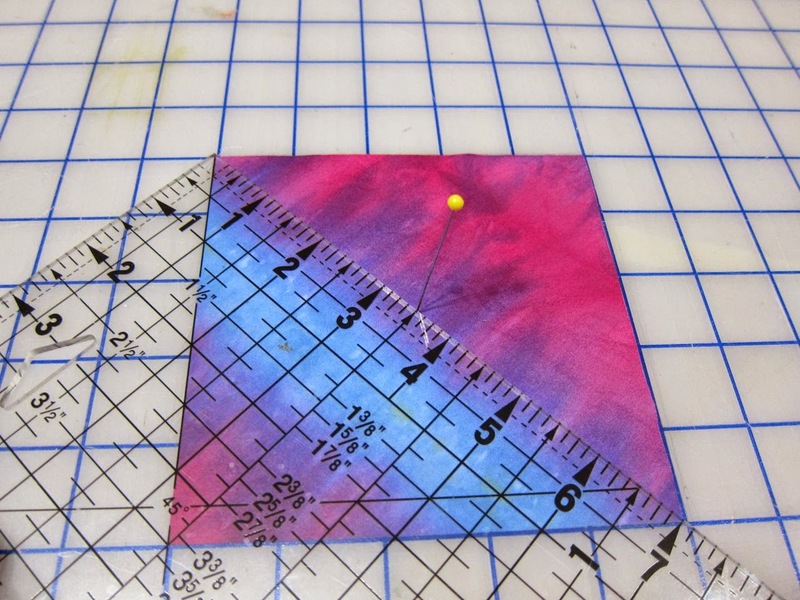 Place the 5x5 fabric square on top of your 16 inch fabric square using the pin to find the center. 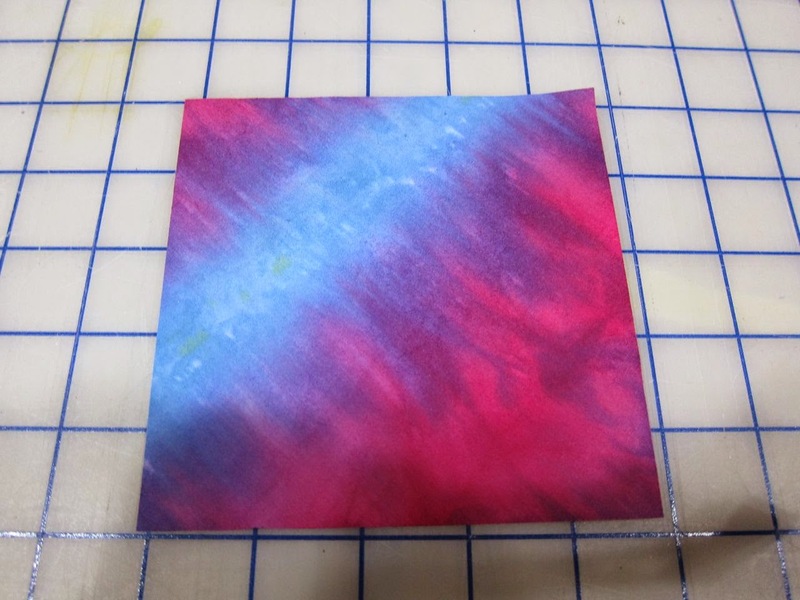 I wanted the corners of my smaller square at an angle to the corners of my larger squares so I drew a chalk line on the fabric that indicated where I wanted the corners pointing. They could have just as easily pointed to the corners of the larger square, it makes no difference. Iron the small square in place. On your larger square mark the centers and 1/2 inch on either side (these will be for your darts). Make a note that the widest point of these darts will determine the shape of your bowl. If you change the width, be careful, darts that are too wide will make your bowl too high and deep and you won't be able to sew them closed on your machine (trust me on this one, I learned the hard way). I encourage you to experiment though! Next, draw lines in chalk from the side marks on the larger square to the tip of the center square. Do this on all four sides of the square. Cut out the darts using scissors (it is difficult to do this with a rotary cutter, but not impossible). 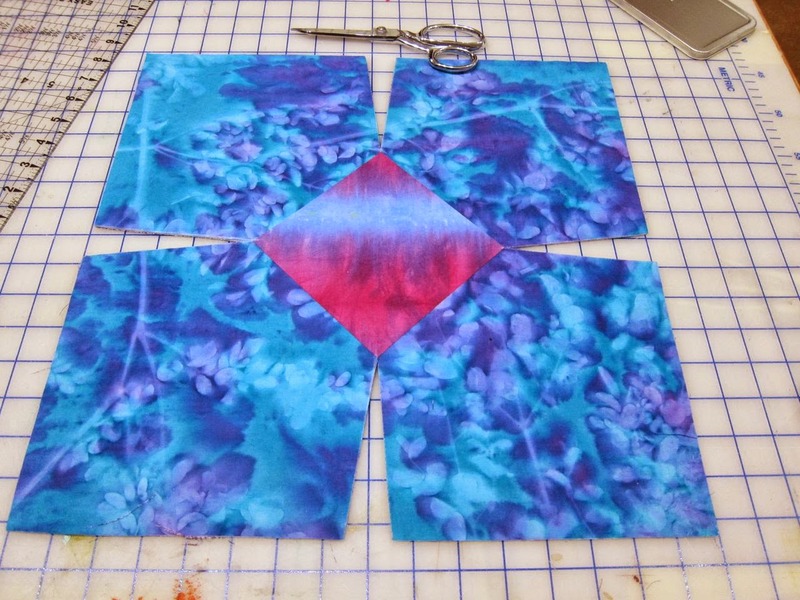 Sew around your center square using a satin stitch. I used a 5mm stitch width. with a length of .30mm. At this point you can also add any embellishments or embroidery that you like. Next, sew the darts closed, starting from the corner of your small square. Also, be sure to note that your bowl is reversible. These bowls can be made in a variety of shapes, round, hexagon, square or even triangular. The principals are still the same. You can also trim your bowls corners to make them round or any angle you would like. You can use 4 darts or 6 darts or even two darts. The possibilities are endless and I would love to see some of your creations! My last blog post about the Scarecrow Artist generated some great feedback. Several people wrote to tell me how much they could relate to the concept. I hope it puts them one step closer to being who they they truly want to be, even if by just a fraction. There was a recurring theme throughout the feedback, however, some felt that their creativity had been devalued so long it became difficult to embrace their talents as something of worth. How many of us heard as children, “Quit doodling (or painting, drawing, etc) and go do something productive.” or “That’s nice, but you need to learn how do something useful.”, or “Yes, it’s pretty, but you will never make a living at it.” There are many variations of these comments and we continue to hear these statements throughout our lives. I don’t believe our parents, partners and friends intended statements like that to be hurtful or demeaning, at least I hope not. I think in many cases, they were, in their own way, attempting to be helpful. But whatever their intention, the message was clear, creativity and artistic endeavors were something to be considered less than productive, useful, or valued. How do we overcome those nagging little voices they put in our heads that say things like, “I really should be doing something productive” or “I will work on my quilt later, if I have time, when the house is clean”. 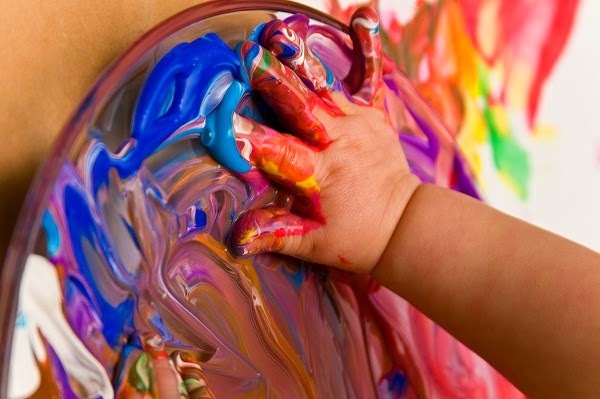 How do we make our creative heart special again? I am not sure I have all the answers, it is a complex question and the answer can vary greatly from person to person. I do believe we can all benefit from offering compassion and forgiveness to the people in our lives who put those voices in our heads. Many of them were frustrated creatives themselves. I know my mother was, she had numerous childhood drawings, poems and artworks locked away in her hope chest. At various points in my life I watch her struggle to bring back that spark, in a variety of ways, most of which never came to fruition. I can’t tell you how many sketch pads, paints, and journals she bought that were never used. Something always “came up” or she was “too busy”. I believe she had to deal with many nagging little voices of her own. In fact, I am sure of it. I was often told the story of my grandmother who was offered a dance scholarship to Julliard only to be told by her parents that she couldn’t accept the scholarship. She needed to do something “useful”, so she became a nurse instead. It was never spoken aloud, but I always felt that she too had some resentments and felt cheated. So it seems the nagging little voices and feelings are inherited. How do you stop them? Again, a good question with no clear answer. I think we can start by forgiving those who devalued, or demeaned, our creative spirit and second by dusting off our inner artist and telling him (or her) that it’s okay to show themselves again and that you will make time for them and allow them to respond to those nagging little voices and say “No, this IS important! It IS productive. It IS of value”. The negative little voices won’t go away easily, they may even argue and shout, but eventually they will give up and fade away. Once they are recognized for what they are, there are no shadows in which they can hide. Empowered, your inner artist will begin to assert itself. It will quickly identify those people, still in our lives, that are toxic to our work and creative spirit. And surprisingly, your new found artist may even forgive them. I recently had a long email conversation with a young, aspiring quilt artist whose name is Julie. She sent me an email to tell me how she admired some of my artwork and that “one day”, she wanted to become a “real” artist. Currently she considered art quilting only her “hobby”. In subsequent email exchanges she sent me photos of her work. Her artwork is truly beautiful, stunning in fact. I asked her why she didn’t consider herself a “real” artist. She listed a multitude of reasons: No art degree, she could only afford inferior supplies and fabric, her sewing machine was old, she only able to work on her art only after work and couldn't do it full time, she could not get “good enough” photos of her artwork, she had never sold anything…the list went on and on and on. I was curious what her art meant to her, so I inquired. “Everything! It makes my soul sing! I am most happy when creating art!”, she replied. I told her in my mind at least, she was and is a real artist. She thanked me but politely argued otherwise, reiterating the variety of reasons she already listed. I thought this very interesting. It made me think of the Scarecrow in the Wizard of Oz when he said “If I only had a brain”. By making that comparison I in no way imply that this young lady is brainless or has impaired judgment of any kind. The comparison is the Scarecrow who refuses to own his intellect until it is validated by someone else and by his “honorary” degree. 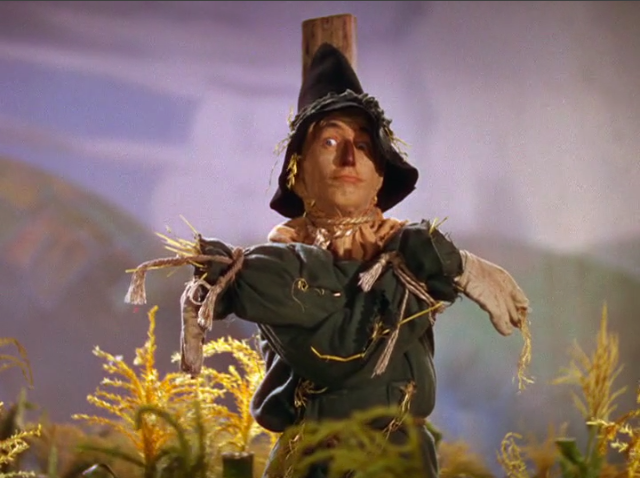 As you recall, everyone else knew the Scarecrow was smart all along. This Scarecrow comparison made me feel sad for this young lady. Here is someone who can create beautiful artwork, but refuses to believe and accept she is an artist. One who can magically turn feeling, emotion and thought into something tangible. Gently, I tried to encourage Julie to own and accept her inner artist, to no avail. It seems she was intent on remaining a “non artist” until such time the Wizard grants her the honorary title of “artist”. I believe she will have a long walk on that particular yellow brick road. It prompted me to think about how we, as artists, find our way to our own individual Cities of Oz and what makes us realize we are “real” artists. Art school can’t infer this magical title regardless of how much they tell students they can (or how much tuition they collect). If that were true you would find a lot more people out there who would call themselves an artist instead of people who call themselves waiters with an art degree. Does art school make you a better at art? Maybe. Does it make you an artist? No. I know plenty of people with art degrees who never called themselves artist. And I know people with art degrees who create artwork solely for money and have no particular feeling about the artwork itself. I don’t consider these people artists, craftsman perhaps, designers perhaps, but not artists. Nor does selling artwork doesn't make you an artist either, it makes you a business person. Purchasing top of the line supplies and equipment doesn't make you an artist, it just means you have financial resources. Even having people like your artwork doesn't make you an artist. Always there will be people who don’t care for your artwork. So what is it that makes some of us artist and some of us wannabes? I believe the answer lies within us. We, as artists, are willing to put it “out there”, consequences be damned. Sure it may sting if someone doesn't like our work, or we don’t get accepted into a show, or worst of all, our work receives criticism or is devalued by someone; still we persevere and continue to create art for art’s sake. We create art because, as Julie put it, “It makes our hearts sing” and makes us feel alive despite whatever else is going on in the world and we want to share that feeling with others. I am sure that there are others out there who will disagree with me about what makes someone a “real” artist is. In fact, I am sure of it. But for all you scarecrows out there, take these thoughts from me, for whatever it’s worth. If you love your art and it makes you happy and you want to share it with the world, you are already an artist. All it takes is for you to accept yourself and your artwork. Once you do your life and the depth of your work will change forever. But be aware, the title of artist doesn't come with any guarantees or magical powers. Once the title is claimed, it must be maintained, and that where the real work of a real artist begins. So good luck my little scarecrows, and may find the end of your yellow brick road and may the gates of Oz always be open to you. As someone who started out in quilting as an art quilter sewing squares and triangles never really held much attraction or fascination for me. That is until recently when my little sister announced to the world that she was having another baby. That is when I decided I would make her a baby quilt. As much as I love art quilts they really aren't all that practical as baby quilts. I thought I might go with something a bit more traditional; how hard could it be? I found a pattern I liked, a simple disappearing nine-patch (how quaint I thought!). Oh I was naive. I cut all my squares..easy! I started sewing them together..a breeze I thought, I will be done in no time...then I started sewing rows together. At this point you could hear the proverbial needle screech across the record. The blocks didn't line up. At least some of the didn't anyway. I reached for my trusty seam ripper and ripped out the thread. 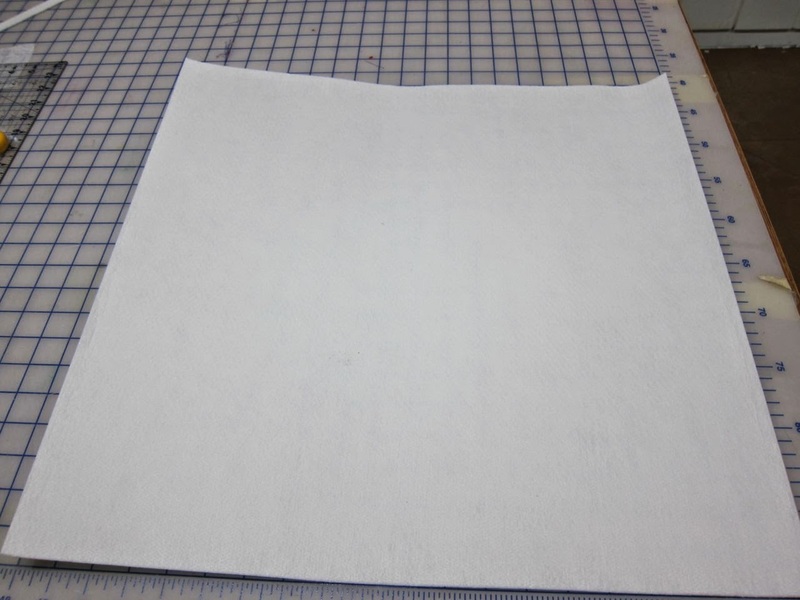 Okay, I thought, let's try this again, slower this time and with a 1/4 inch seam guide. I stepped on the pedal and once again began to sew my rows of neat little blocks together. I took it off the machine and...no dice... although little better ... still huge gaps. Okay, time to dust off those old "traditional" quilting books. I read and read. Unfortunately the books weren't much help. What was the trick? Thousands of people people do this every day. Why can't I? 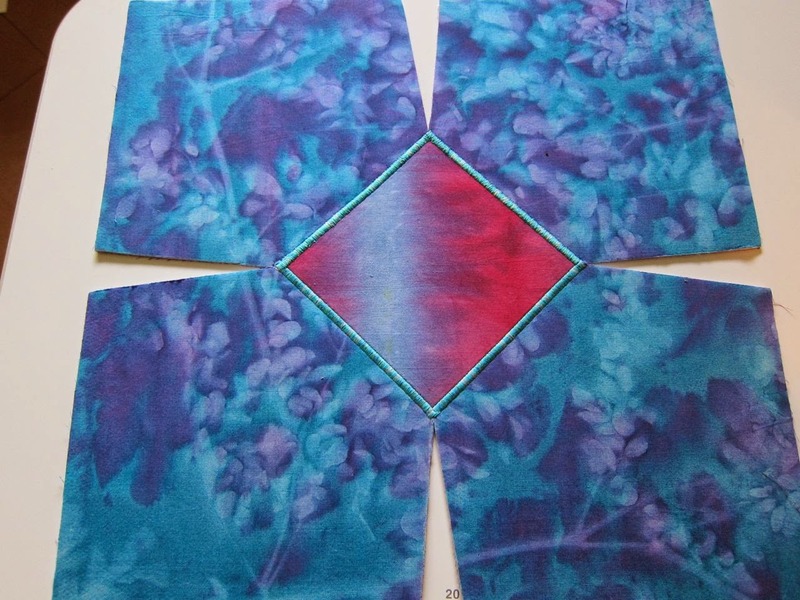 I have created dozens of beautiful art quilts, dyed and painted my own fabric, digitally printed fabric and even sewn clothes. Why couldn't I sew little blocks together and make them match up? After scouring the internet I came across a blog called MicheleMadeMe.com. On her site she showed some very clear instructions for matching seams. Following her instructions made things much easier. Finally, MOST of my seams matched, but not all. What's the deal? Were my blocks cut wrong? No Was my ruler off? No. Was my machine broken? No. At this point I decided to contact a Facebook friend and begged her to explain to me this mysterious, magical seam matching process. She went through, step by tedious step, of my sewing process. She agreed that I was using the correct techniques, machine and tools. Then what was keeping my seams and squares from lining up properly? Could she PLEASE enlighten me? What do I need to do to make this magical process occur. Her advice was as simple as it was humbling"
Ouch. It appears that sewing little squares together isn't as easy as I had imagined. And while I never publicly voice my opinions to my "traditional" quilting friends I had always assumed that sewing squares and triangles was not so much an art form as it was a matter of simply following a pattern It appeared I owed more than a few people an apology, even though they were not aware of my internal thoughts. I reviewed the images that people had posted to Facebook or pictures of quilts they had sent to me. Hats off to you my seam-matching friends. I truly had no idea! My apologies. 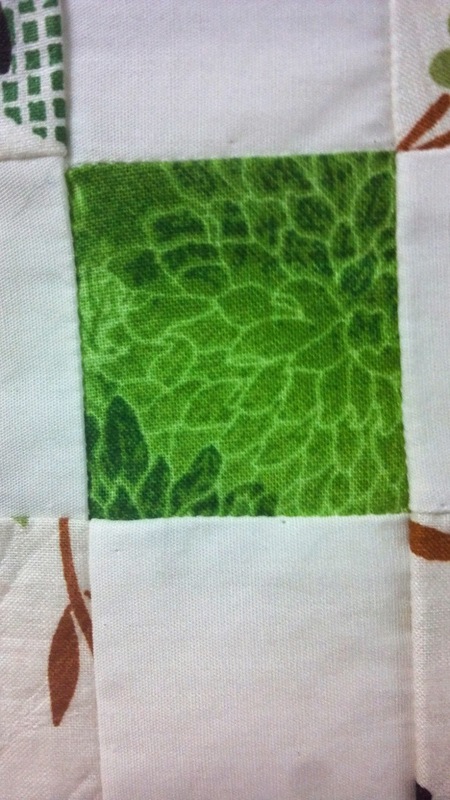 I feel as though my quilting education has begun again. I also began to think how I could incorporate these perfectly matching seams (which I have yet to perfect) into my artwork. We shall see. Until then I plan to practice, practice, practice. This is my penance for not realizing sooner that these little squares and triangles are truly an art unto themselves.